Estimating mean wind speeds and their profile. The output power and the cost effectiveness of a wind turbine is strongly influenced by the mean wind speed to which it is subjected. Obtaining a good estimate of this speed is therefore of central importance in a planning exercise. For large commercial installations, a good deal of expert effort will be devoted to this aspect of the planning but, unfortunately, when it comes to smaller turbines, there is often a glaring absence of basic understanding of the aerodynamics of the natural wind. 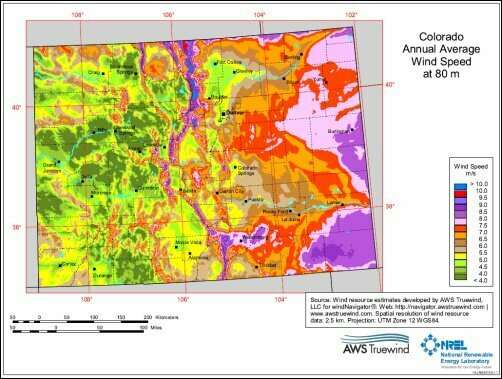 This is a map in Adobe Acrobat pdf format giving the mean wind speeds at a single height of 80 metres above the ground. The map is not detailed enough for local use but, by clicking on a state, you are transferred to another page from which you can download a far more detailed map. The figure below of the Colorado State map shows the general layout and it is possible to zoom into these maps down to a resolution of 2.5 kilometres. For the UK, the Department of Energy and Climate Change has a freely available wind speed database (known as NOABL - Numerical Objective Analysis Boundary Layer) but it is not particularly convenient to use and, on the next web page 8, a much more convenient program is described which can be downloaded from our download page. It is important to stress that the calculations on which the databases are constructed make use of the large scale geographical topography of the area but not the detailed topography - particularly the man-made contribution to the topography. At this point, it is interesting to make the general point that high wind speeds are generally associated with high terrain in the form both of gradually rising terrains or rapidly rising terrrains like hills and cliff tops. 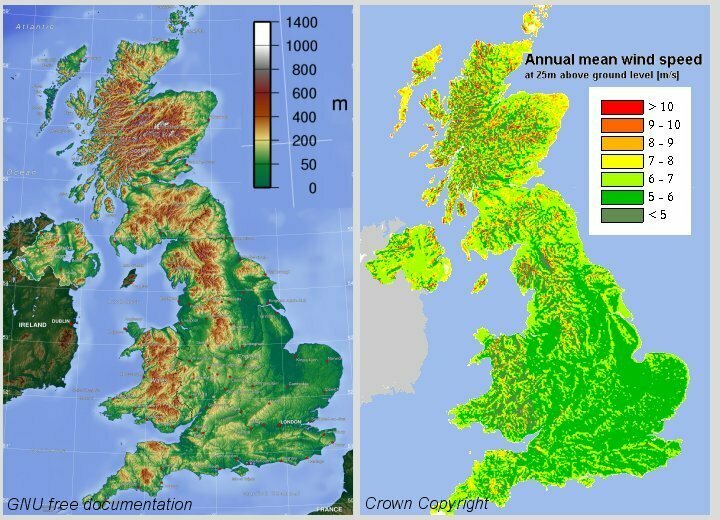 The maps below show a topographical map of the UK compared with the wind map. The correlation between the two is clear. It will be noted from the above that wind speed is a function of height above the ground. Simplifying, there are two effects that influence the shape of the wind speed profile. The first is the contours of the terrain. A rising terrain such as an escarpment will produce a fuller profile at the top of the slope compared with the profile of the wind approaching the slope. With a ridge, there may even be some overshoot as shown in the sketch below. In choosing a site for a wind turbine, it is therefore important to look at the local terrain to see if there is the possibility of making use of these effects. They can have a very substantial effect on the economics of an installation. The other effect that has a strong influence on the wind profile is the aerodynamic 'roughness' of the upstream terrain. This might be natural roughness in the form of woods or man-made roughness in the form of buildings. A large urban area will have an enormous effect on the extent and shape of the velocity profile as illustrated in the sketch below. The sketch shows an example of a situation where the upper wind has a velocity of 10 metres per second but is passing over terrrains with quite a different 'roughness'. 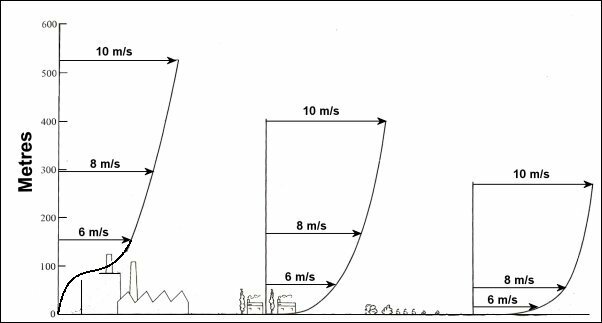 In the centre of an urban area, a mean speed of 6 metre per second might not be reached until a hundred metres or so above the ground whereas in a flat grassy area, the 6 metre per second height may be only 10 metres above the ground. No great significance should be attached to the precise numbers but they do reflect the order of the effect. 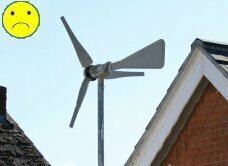 It is for this reason that siting wind turbines in an urban environment is not generally a very good idea and this includes small turbines mounted on house roofs. Just occasionally, it may be possible to exploit some local effect but generally the performance of wind turbines in these situations is very poor. Examples of small turbine installations. We start with two good examples of the siting of small wind turbines. 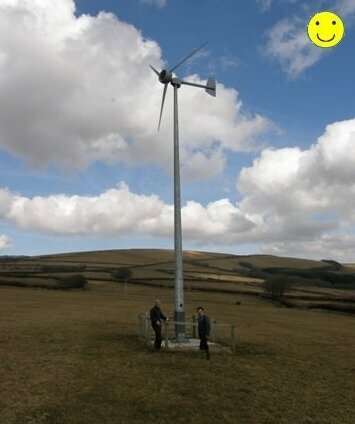 The photographs below show two installations of Evance R9000 turbines on sites of open terrain. The top photograph is on West Ilkerton Farm on Exmoor, Devon and the other is in the Orkneys off the north coast of Scotland. In both cases, mean wind speeds at the hub height would have been around 7 metres/second and, with the feed in tariffs, both turbines would pay for themselves in around five or six years and give a return on the investment over twenty years equivalent to a compound interest rate of around 7%. An example of poor siting is a Proven 6 installed by the local authority on a residential block in the middle of London. 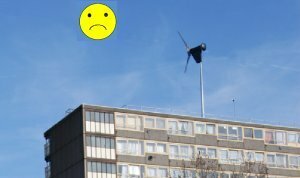 With a mean wind speed of less than 4 metres per second and very high installation costs of over £60,000, this is a classic example of local authority 'silliness'. There is no prospect of ever recovering the cost of the installation - grants aparts - and a belief that small turbines can make a useful contribution to reducing our carbon emissions - which was one of the local authority claims - shows only an inability to do arithmetic. 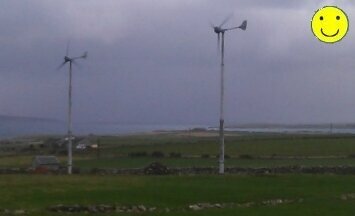 By contrast, a carefully sited small turbine on a windy rural site can generate useful amounts of electricity at a reasonable cost and can be a worthwhile investment - particularly if the cost of electricity continues to rise. It is also worth noting that the Which magazine carried out a test on a small Windsave turbine (rotor diameter 1.8 metres) in an urban environment where the wind speed was only 4.7 metres per second. Because this unit had a controller that used electrical power even when the wind turbine was stationary, this installation consumed more electricity than it produced over a six month period. The company that produced the Windsave turbine has now 'folded'. The urban environment not only influences the mean wind speed but it also affects the variability or standard deviation of the wind speed and thus the mean power too. The WindPower program enables the effect of wind unsteadiness on the mean power to be easily examined and webage 15 gives examples of the possible impact that the urban environment can have on the wind speed standard deviation. A final point should be made about the very near effects of a building or structure. The flow around buildings either in isolation or in the presence of other buildings is complex. As the (not very good) sketch below shows, there are regions of highly turbulent recirculating flow which obviously should be avoided as a site for a turbine. Generally speaking, one should aim for height but some slight speed advantage might be gained above a roof ridge or, if the wind is from a predominant direction, slightly downstream but above the roof ridge line. 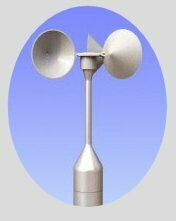 The placing would have to be quite subtle and really would require some on-site measurements with an anemometer to establish the best position for a turbine. It may seem completely obvious that a wind turbine needs the highest possible wind speeds in order to perform well but it is surprising how many installations there are where this seems to have been overlooked. Whilst this might be understandable in the case of small wind turbine installations, it is regrettably true of some large installations too. There are wind farms in the UK (and no doubt elsewhere) where the mean wind speed is under 6 metres per second and they are only economic by virtue of the Renewables Obligations Certificates that the government issues to encourage investment in renewables. Incentive schemes need to be coupled to planning guidelines that insist on good engineering practice. If there is no insistence on good practice, wind power will cost more than it should and won't perform as well as it could. Next is a description of our UK wind speed database program.